Here's the trend report I filed with Houzz.com last week. There are a couple of major things I saw that will be here this year, I can feel it in my bones. I'll write more about them later. The German city of Cologne is rapidly becoming the place to watch when it comes to cutting-edge design. 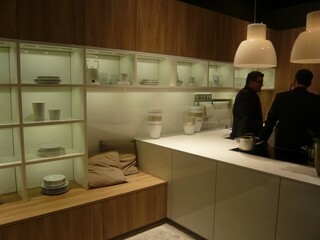 Last week I was honored to attend Cologne's 2011 Internationale Möbelmesse (IMM) design show. A highlight was a kitchen-specific section called the Living Kitchen — the largest kitchen design trade show I've ever attended. As somebody who's been to more kitchen design trade shows than I can count, that's saying something. I was one of six U.S.-based design bloggers brought to IMM and the Living Kitchen by Blanco, a German sink and faucet manufacturer. What I saw is nothing like what I know is going on in the design scene in the U.S. As a kitchen and bath designer, I'm curious to see how quickly these trends and ideas end up in the U.S. The photos in this ideabook are images I photographed as I walked around the show Jan. 20-21. There are also some show-provided images that help make the points my own photography can't. As you look at the photos, resist the urge to reject the ideas outright. European kitchen designers are solving the same problems any designers are, but many of them come up with unique solutions that will end up being used by the rest of the world eventually. Can you see any of these designs working in your own home? Kitchens that integrate into the rest of the home are big — huge — in Europe right now. Every kitchen seemed designed specifically to blend into the rooms that surround it. 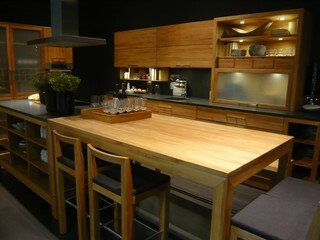 Can you see this level of kitchen integration ever working and becoming popular in the US and Canada? Without a doubt, the biggest trends I saw in Cologne last week were textured, naturally-stained wood and skinny, skinny counter tops. Count on that skinny counter top trend showing up in the US and the rest of the world very quickly. In two solid days of walking around the show, I could have counted on one hand the number of 3-centimeter "American" counters I saw. There was very little granite but a lot of laminate and a porcelain counter material that's unavailable in North America. These 1-centimeter skinny counters stood out because they're in such stark opposition to what we see in the U.S. and Canada these days. What would it take to get you to embrace the 1-centimeter counter? 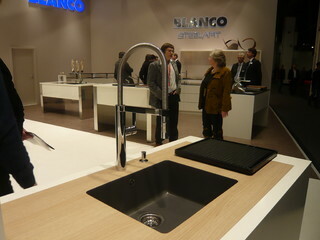 This sink and faucet combo by Blanco shows something we never see in North America. This is a ceramic sink undermounted in a laminate counter. The conventional wisdom in North America is that we can't undermount a sink in a laminate counter. European designers do it all the time, and it looks terrific. Europeans use laminates in kitchens in ways their North American counterparts never would. It makes sense though. Laminates are sustainable and long-lasting and they look terrific when they're used properly. 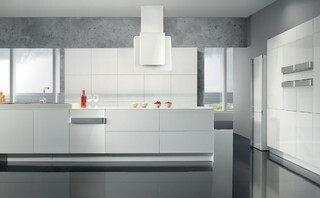 The current European version of the Great American White Kitchen is a white-and-wood-tone laminated kitchen. What do you think of this white-and-wood-grain combo? 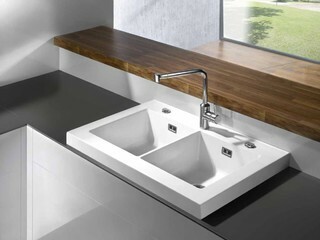 Most European kitchen sinks have integrated drainboards. Drainboards are a a feature that's utterly missing from North American sinks. Why do you suppose that is? 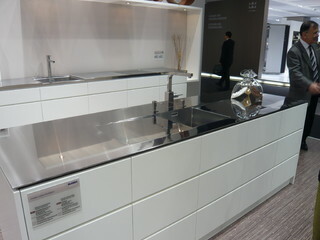 This mirror-finish counter and integrated sink from Blanco is what's called a floating counter. 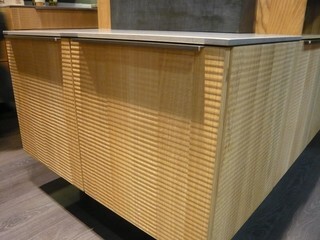 In a floating counter, the 1-centimeter counter sits on a smaller deck to enhance the effect of the skinny counter. This is the exact opposite of everything we see in the U.S. right now. I applaud this direction and I wonder how it will play in this side of the Atlantic. Another interesting think I noticed in Germany last week is that most kitchen sinks are drop-ins as opposed to the undermounts so popular in the U.S. In looking at this photo, I see skinny counters, laminate surfaces and a drop-in sink. 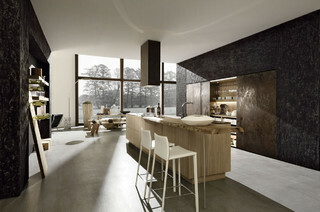 Integration is the key to European kitchen design. Large, professional-size appliances were no where to be seen. Every appliance. it seemed, could be folded away and hidden when it wasn't being used. A lot of this comes from the smaller average size of a European home, but not all of it. A bigger presence of integrated appliances is something I know we'll be seeing more of in North America. The right wall of this kitchen vignette show sliding doors that make the working parts of this kitchen disappear when they're not in use. For every integrated kitchen design that included a kitchen table and a sofa, there was at least one that tried to fit against a wall and be beautiful for its own sake. A kitchen this minimal and streamlined is enough to make me want to purge all of my kitchen gear so that I could live with this small space. This kitchen covers all the bases, from the floating, skinny counters to the integrated appliances on the back wall. The island in the center of the room is as much a coffee table as it is a kitchen island. Could you ever use an island like this? 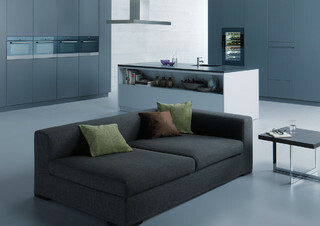 This kitchen from the appliance manufacturer Gorenje integrates a refrigerator, two wall ovens, a steam oven, a microwave, a dishwasher, a cooktop and a hood. That's a lot of appliances, but this room doesn't feel at all appliance heavy. What do you think about this level of sleek and minimized appliance integration? What I found most interesting were the U.S. manufacturers who were at IMM's Living Kitchen and showing new appliances they don't sell in the U.S. 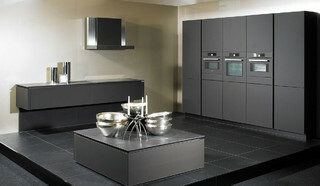 This is a stack of built-in appliances from KiitchenAid, a brand made by the Whirlpool corporation. 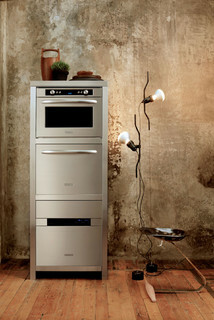 Shown here are a steam oven, a small dishwasher and a wall oven. Can you see any of these trends ever making it on this side of the Atlantic? I'd welcome them, but then again, I'm a designer. I'm fascinated by all of this and I'm anxiously awaiting the arrival of the skinny counter on these shores. What about you? Excellent post... really enjoyed all the pics. 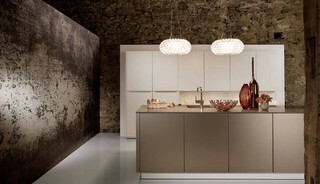 And agree with you that "Integration is the key to European kitchen design." - Having lived in Europe over a decade now, the one thing I've noticed in all my friends home regardless of whether we're talking about a chateau in the south of France or a pied a terre in Paris, large, professional-size appliances are no where to be seen. Your comment, "Every appliance. it seemed, could be folded away and hidden when it wasn't being used." - is so true of my own kitchen. American guests staying chez moi always ask.."Uh, Where's the fridge?" My kitchen is large by European standards, but yet my fridge is still dorm sized! (True American that I am, I hide a 2nd refrigerator in my wine cave!) Really enjoyed this post. As beautiful as these kitchens are, I don't see how well they'd play out in the majority of American homes. Europeans and Americans live differently. I spent a summer in Europe and remember the small kitchens in small homes. Integration is more important when you don't want your kitchen cabinetry to loom over your 900sf flat. The kitchen can be a bit more obtrusive in a 4500sf Houston McMansion. The Antiques Diva's dorm fridge is a prime example of how differently we live. While she may have a second hidden away frig, most Europeans can get away with a tiny frig because of frequent market stops. A Costco sized case of yogurt or hotdogs takes up a huge amt of refrigerator real estate. Americans like to drive our giant SUVs to the warehouse store. Having said all that, I really enjoyed this post and loved seeing what they're showing in Europe today. Thanks for sharing. Love the skinny countertop. Countertop should be used, and not seen, I say. I use 3cm now, but would prefer to use 1cm (if it wasn't special order.) Do you think that it should be used with a flush case trim reveal or zero clearance reveal? I guess that would depend on the door-style. For example, slab doors should be flush to the case, where as thicker-shaker style doors should be bumped up a bit with a trim piece. I like the look! 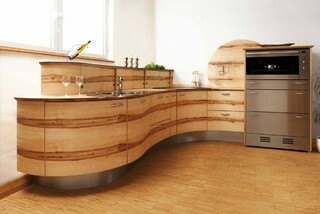 I like more wood and lighter more organic looking kitchens. The thin counters are interesting. How do they live - is there a potential breakage issue? I love to see what Europe is doing and how it will translate to US market. Toma: I envy you your life! Thanks for the comment. Laxsupermom: It's true that Europeans and US-ians live differently and every time I go over there I come back more convinced than ever that the root of the problem in the US is the "Costco-sized cases of yogurt." What do we get in exchange for the appearance of bounty? Cory" I like it with a 3cm shadow line underneath the 1cm counter. All it takes is a deck below the counter that around 2cm deep and 2cm smaller than the overhanging counter. This floating counter lifts the whole kitchen and makes everything appear to be lighter and more free. The 1cm counters are every bit as resilient as the 3cm counters we see in North America, it's just a question of aesthetics. Paul, I really enjoyed this post, especially since I was in England house hunting 2 weeks ago. I am able to imagine the various kitchen features you discussed clearly since the kitchens in the houses I saw are fresh on my mind. Were you just in heaven the whole time you were at that show?! I would have been that's for sure. I love the sleek look of the kitchens in the images you shared. They look so calm and clean. Regarding the thin countertops - did they look to be in the right proportion to the cabinets, etc in the kitchens where they were used? One thing that I found to be very curious in the majority of the houses I saw in England was that in many cases the houses themselves would be very traditional in style in both the exterior of the houses and interior rooms with the exception of the kitchens and bathrooms. Those spaces would almost always be sleek and streamlined looking, similar to they styles shown in your pictures. I found those extreme juxtapositions to feel quite odd. Will the "average" American embrace these less-is-more ideas? Unfortunately, I feel the answer is not just no, but hell no! One of my biggest takeaways from my week in England is just how glutenous Americans are in so many areas of our lives. It is embarrassing really. Sharon: Since kitchens and baths are the rooms most likely to be changed in an older (by European standards) home, it makes sense that they would show up as more modern spaces.I've spent the last couple of weeks staring American gluttony in the face and it is embarrassing. What's even sadder is that in the eyes of the rest of the world, the US perspective on things is easily dismissed and thought of as irrelevant. That the tone of our national discourse is set by the likes of Sarah Palin and Michelle Bachman doesn't help our standing on the world stage. And that's what's embarrassing. Sorry, don't know how to give myself an identity so am posting as anon. As a 'European' (from the UK - Europe is not really a description that covers our diversity of culture/aesthetic as distinct nations) I take great comfort from this post. I have taken to following a few select design blogs while redesigning my own kitchen and the USians appear to be at the forefront of these, although the style directions, it's true, don't always fit with us in this part of the world. My new kitchen will have a skinny top (I too asked the question "will it break if I screw on a pasta machine? "), a white and wood tone laminate mix, a kitchen/living space blend and, of course, a blanco sink with integrated drainer (drainboard) (how do you guys manage without one?). I was beginning to panic that no one else was doing any of this and now I can take a little comfort from knowing that we do things differently here and, maybe, it's even a bit more cutting edge - phew! Paul, I love your blog - great and useful information even for someone trying to aquire some design literacy from a standing start. Glad to know that we can embrace our differences, style and lifestyle wise, enjoy them and learn from each other. love this post and the blog. i'm going for skinny in my new small kitchen too! can't wait to get the order in. Thank you anon I and anon II! This is a timely post for us as we debate whether and how to build-up the edge of the 2cm marble we've chosen for our kitchen island. Perhaps we don't need to. It's a different aesthetic, but funny how the eye seems to see things differently as trends take hold. I'm thinking of how strange new car models can appear when they first come out, but how familiar the new shapes become. That lighter, sleeker look has appeal. In your more recent post, the sink drain dial seems like an ingenious feature that I wish were more common here. Your blog is an invaluable source of information for us as we proceed, slowly, with our own home renovation. We enjoy your plugs for Canada too, eh. Great blog S&N, I'm your newest follower. I'm glad to hear that you're finding this stuff useful. You know, two weeks ago I'd have told you to build up that 2cm counter but now I'm not so sure. A lot hinges on the style of the room of course, but it's sometimes nice to have counters that just aren't massive. I would love an integrated kitchen! My pet peeve is cooking in the kitchen all by myself and feeling left out of the general festivities going on in my house. I would have to entertain more if I had one! Beautiful job on those kitchens, the walls are elegant, warm and rustic.